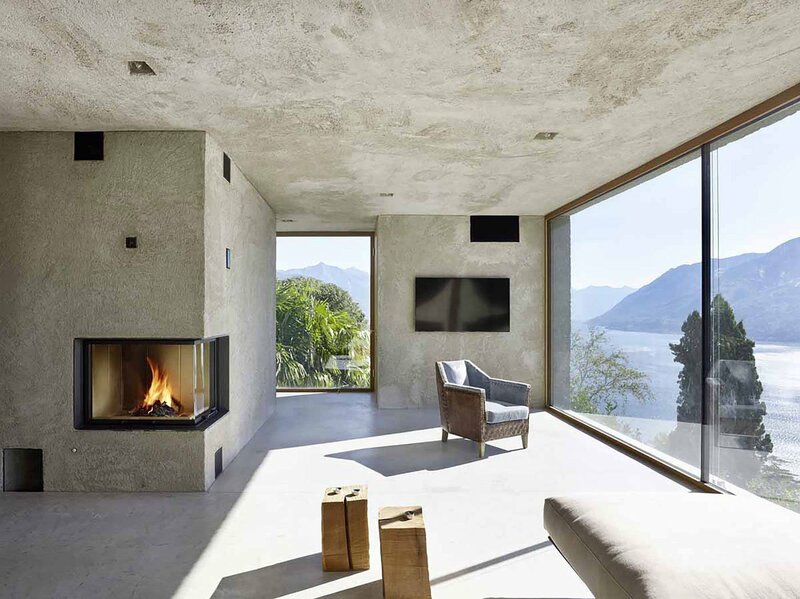 This home by Wespi de Meuron Romeo Architects is caught between a road and a body of water, the Lago Maggiore in Brissago, Switzerland. The impressive house contains three bedrooms and bathrooms as well as the expected common areas, unexpected outdoor nooks, and recreational rooms for fitness, a sauna, a swimming pool, and a garden. Deceptively simple, the structure at first seems to be a concrete block punctuated with square windows of varying size. But, upon entrance, the home is exposed as a much more fluid space connected by staircases running from the ground floor to the roadside rooftop. Between these two points, one finds a serene stone courtyard and wooden sliding doors perforated with a large dot pattern. These man-made enclaves create a heightened sense of naturalism and a fresh way of taking in the view of the surrounding lake and mountains.